I accidentally stumbled upon SlideScreen app for Android when I was scouring the Android Marketplace. I immediately searched for what others have saying about this app and was glad with the positive reviews it received so far. To cut the long story short, I installed SlideScreen on my Nexus One and immediately turned it on to see how the app goes. 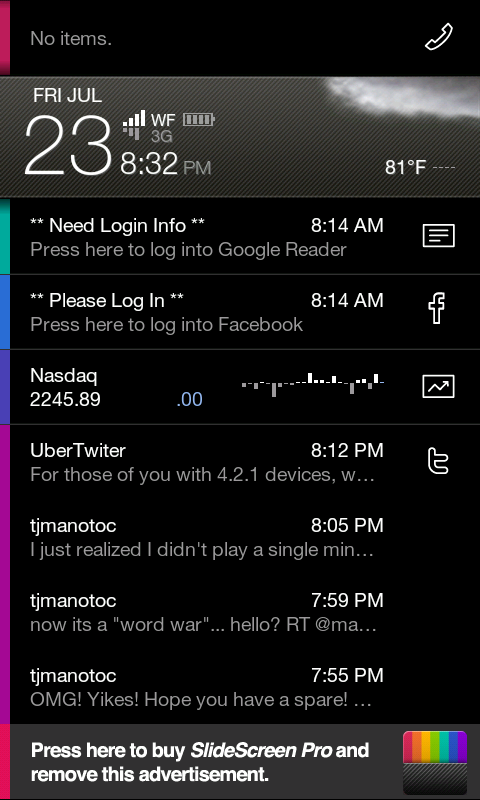 The moment I fired up the app, I was completely amazed by what it did with the home screen of my Nexus One. For awhile I thought I was using a Windows Mobile phone. Gone are the cool icons and the widgets and in their place is a list of various information that I could only get by firing up several Android apps one after another. 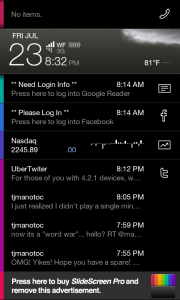 SlideScreen replaces your Android phone’s current home screen with a single home screen containing weather info, Twitter timeline, call register, email, calendar, messages, RSS feeds, Twitter apps and more. Whatever appears on your new home screen is determined by none other than yourself. You can easily remove tabs as well as add new ones. The app also allows you to add as much 8 shortcuts of your most used Android apps on the home screen. SlideScreen is definitely not for everyone. Android users who are used to fancy widgets and colorful app icons on their phone’s home screen and app launcher screen will definitely stay away from this app. It’s more for the information-savvy Android owners who want a single place to hold all the important information they consume on their Android phone. SlideScreen offers functionality rather aesthetics. It’s up to you to decide which of the two is more important to you. SlideScreen is available as a free (with limited features) app from the Android Marketplace. A more advanced version is also available for $6.99.